What is the Pebble Air? 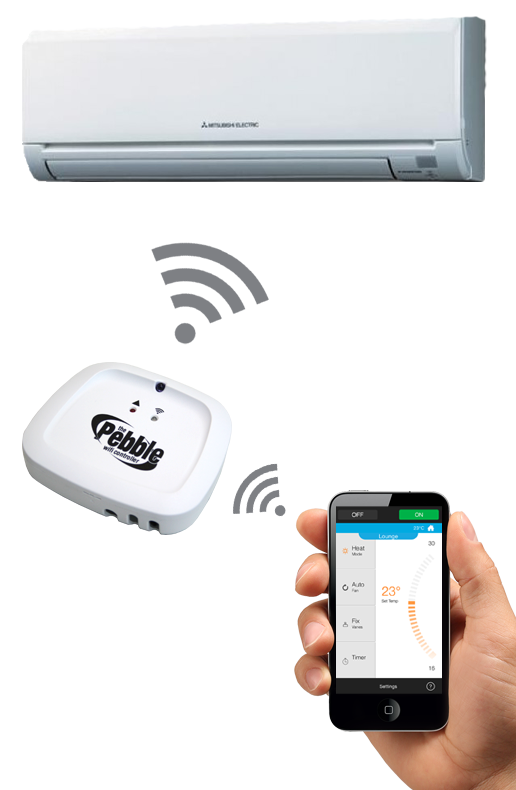 Pebble Air is an universal solution for controlling your heating, ventilating, and air conditioning (HVAC) units from you smartphone. Once securely connected to your wireless router you will be able to control your air-con/heat-pump/HVAC through our smartphone app Pebble Air. The Pebble Wi-Fi HVAC controller uses patented technology which allows for a secure connection to your local wireless router through your smartphone. The Pebble Air is simple to use! Any Android and iOS smartphone can use “The Pebble” through our intuitive app Pebble Air. Our Pebble Air app allows users to instantly access their air-con/heat-pump/HVAC unit anytime, anywhere. Smart mode features of the Pebble Air app all add to the user experience.